This mango seedling germinated from the stone of mango fruit that was picked from the mango tree that grows in my grandparents’ back yard in India. Mangos are strictly tropical plants. They’re completely tender, require baking hot, strong sun and need to yo-yo between bone dry and being drowned in water. Being trees they send down a taproot that goes deep (for water during the dry season). Natively they grow into large trees. If you have a hot, heated, south-facing greenhouse on the south coast, you still barely have a chance of getting one to fruit. If you do, you may want to tell Kew, who waited 20 years for their tree to fruit (and even then just got one mango). So why grow one? Well, they’re not your average houseplant and are surprisingly easy to germinate. They’re low maintenance and they have an exotic look to them, with the stone visible on the surface of the soil and deep green glossy leaves. The bronze colour of young leaves protects them from the strong sunlight until they mature and is also attractive. Germinating mango is much easier in a hot summer than in the depths of winter. To initiate the germination process, water needs to penetrate the tough outer surface (stone) to the seed inside. Some people split and remove the stone but this isn’t necessary. Germinating tropical plants in the UK is a very hit-and-miss process. To ensure you have at least one mango, eat several (and plant several). You can give any extras to friends. Water thoroughly (usually by dunking) only when the soil feels very dry – usually every two weeks (like orchids). Over-watering will rot the mango roots. Even with the best care and attention, mango plants may only last a good few years. They want to grow into trees, send down deep roots and want temperatures above 30°C (86°F) for most of the year – this simply isn’t possible in many parts of the world, including the UK. You should be prepared to let your mango go when it is time, the good thing is that they do germinate relatively easily so you can start again (and the “seeds” are cheap). 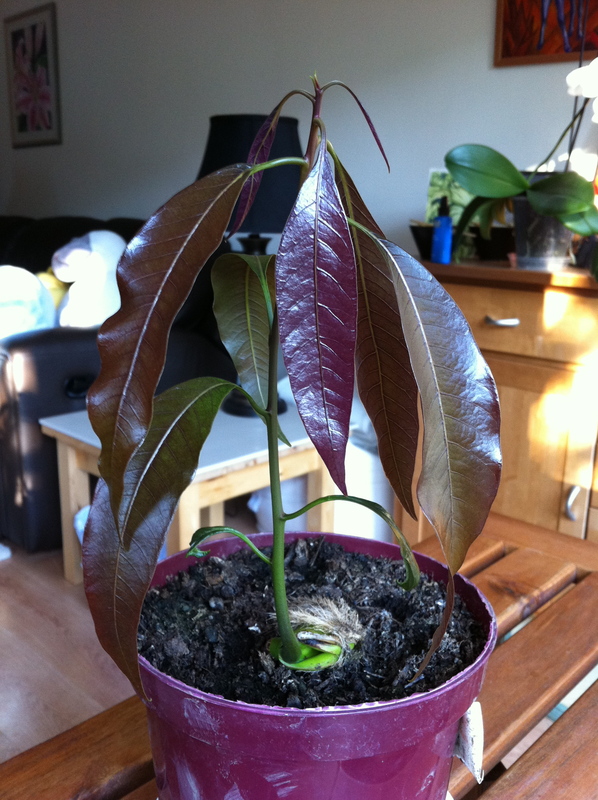 The mango in the picture was been given to a friend very soon after – I didn’t want to have the disappointment of seeing it die after a few years when it either gets too big to handle or dies of cold. I’m terrible for getting attached to house plants.